﻿ The First Lightning Maroon Captive-Breds: What Am I Bid? The First Lightning Maroon Captive-Breds: What Am I Bid? 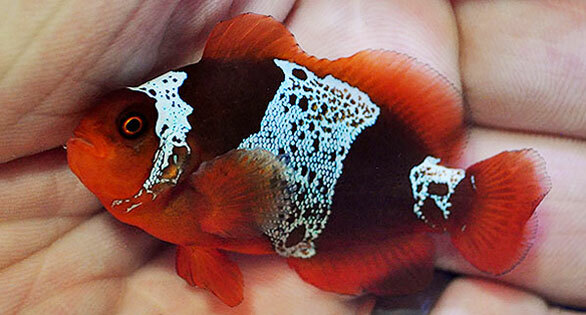 First-generation captive-bred “Lightning” Maroon Clownfish. Image copyright © 2013 Matt Pedersen. Three years after a strikingly pigmented aberrant morph of Premnas biculeatus was collected off Fisherman’s Island in Papua New Guinea (PNG) and quickly made headlines throughout the aquarium world, the first captive-bred Lightning-type offspring are about to reach the open market via an online auction. Group of F1 young descendants with Lightning Maroon genes. Not all display the distinctive lattice-like white pigment pattern. Image copyright © 2013 Matt Pedersen. Details of the auction can be found on the Blue Zoo site. Martin invites interested aquarists to sign up for newsletter updates. More details on the breeding of the fish can be found on Matt Pedersen’s blog, The Lightning Project. “Since we don’t know how Lightning genetics work,” says Pedersen, “I cannot say whether the regularly patterned siblings carry an important Lightning genetic component (like a hidden recessive gene) or not. It is my hunch, however, that the Lightning trait is either a dominant or partially dominant trait, although with the 50/50 split (Lightnings to “Classic Maroons”) in the first generation offspring, the possibility of a recessive trait is there. Will more be coming? “If things go well with the initial five being auctioned by Blue Zoo, there are approximately 25 additional siblings that we’ll sell in this manner,” says Pedersen. His Lightning broodstock are on hiatus right now, following the recent birth of Matt and Renee Pedersen’s second child, a daughter named Audrey. 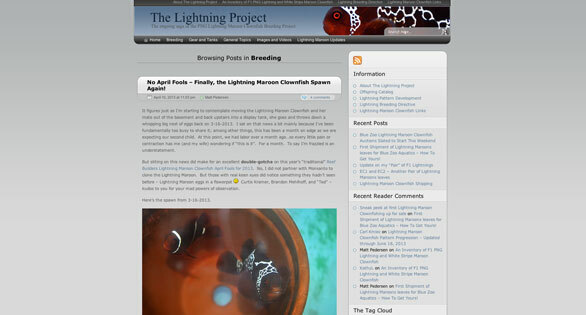 Lightning Project blog is a journal documenting the challenges and successes of Matt Pedersen encountered in his attempts to breed this unusual clownfish. 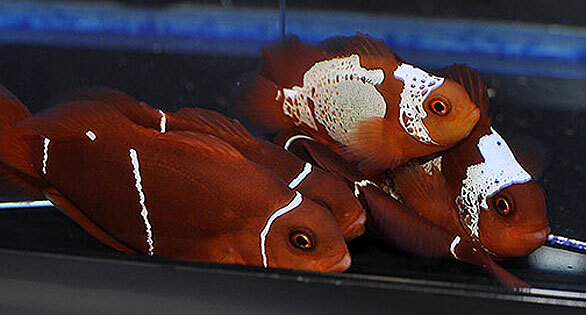 Blue Zoo Aquatics has generated $11,795 in bids on five young Maroon Clowns, with several days bidding to go on eBay. The first fish to go up stands at $5,300 bid.